Jay and I returned to Rohatyn yesterday with Batya and David Kidron of Israel. Batya’s mother, Sarah Rokeach, was born in Rohatyn in 1923 and hid during the War along with a dozen other Jews in the basement of the Nazi administration building, located today at vul. Halytska 40. Jewish survivors visited the building during the 1998 memorial visit, and we have also visited it several times since 2011. This was Batya’s first visit to Rohatyn. 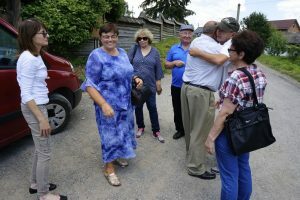 Her primary motivation for coming to Rohatyn was to learn if there are any living descendants of Panteleimon (Panko) Brodoviy, the righteous Ukrainian man who helped Sarah and the others survive while hiding in the basement. During the discussion at the library. Photos © 2017 Marla Raucher Osborn and Jay Osborn. With the assistance of Olha Blaha-Maletska, director of the regional museum “Opillya” opening this summer in Rohatyn, arrangements were made for our group to meet friend and local historian Mykhailo Vorobets at Rohatyn’s public library. Mr. Vorobets has been researching, writing, and lecturing many years about Rohatyn’s prewar Jewish families. He has been aware of the significance of the administration building’s role as a hiding place for Jews. Sarah’s own story was brought to his attention through letters from Batya to the City of Rohatyn, and there are accounts about those who hid in the building in the Rohatyn Yizkor Book as well as writings by other Jewish survivors. In the March 21, 2017 edition of “Voice of Opillya” (a local newspaper), Mr. Vorobets co-authored an article with Olga Verbiana about the building at vul. 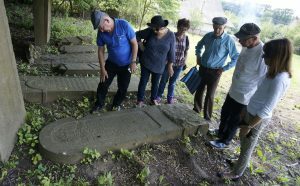 Halytska 40 as a wartime Jewish hiding place, and Panko Brodoviy’s role, along with his wife Anna, in saving these dozen Rohatyn Jews, mostly teenagers. A group picture after the meeting; Batya at center between Mr. Vorobets and Mr. Brodoviy. Photo © 2017 Jay Osborn. Olha hosted our meeting at the Rohatyn public library where we were joined by Ivan Brodoviy from Ternopil. Ivan is a nephew of Panko; his father was Panko’s brother. He recounted to the group how at age 7 or 8 he learned that Panko, Panko’s wife Anna, and Ivan’s own father Onufriy, all of whom were employed in small jobs at the vul. Halytska 40 building during the war, had worked together to keep Sarah and the other Jews hidden and fed, arranging to bring them food from the Brodoviy household. After the discussions at the library, our group walked a few blocks to vul. Halytska 40, today an agricultural administrative building. Olha prearranged our access to the basement, which is currently under renovation. There, the two dark, damp rooms at the rear of the basement that housed Sarah and the other Jews, used for coal storage during the war await renovation. Had the group from Israel arrived a few weeks later, the rooms would no longer be in their original wartime condition. Visibly upset, Batya at first would not enter the rooms, but ultimately changed her mind and stood crying silently in the shadows. Her mother never spoke of her wartime experience in Rohatyn, and it was only after Sarah’s death that Batya learned of the bunker and role of Panko Brodoviy. Outside and underneath the administration building; in the dark, Batya finally enters the space where her mother hid during the war. Photos © 2017 Jay Osborn. At the grave site of Panko and Anna Brodoviy. Photo © 2017 Jay Osborn. Panko passed away in 1954, and his wife Anna the following year. Both are buried in the graveyard of Rohatyn’s historic 17th-century wooden Holy Spirit church (a monument inscribed on the UNESCO World Heritage List), at the Hnyla Lypa river. Together our group went to their graves to pay our respects yesterday afternoon. As part of our history and education projects, Rohatyn Jewish Heritage hopes to document the righteous acts of individuals who helped Jewish Rohatyners during the Second World War. We realize that we will not likely be able to apply to Yad Vashem for official status as Righteous Among the Nations for Panko Brodoviy; there is too little hard documentation and first-hand testimony available to meet the institution’s requirements. Batya herself heard nothing about her mother’s story of survival until after her mother’s death, when the details were revealed to Batya by a close friend of her mother’s. An emotional parting of the families united by a linked past. Photo © 2017 Jay Osborn. Nonetheless, we believe that these individuals, Ukrainian and Polish, who risked their own lives and those of their families, should not be forgotten. 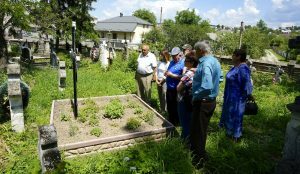 To this end, we will continue to work closely with both Batya and Mr. Vorobets as well as other Jewish descendants who are members of the Rohatyn Shtetl Research Group, to learn more about Panko Brodoviy and the role he played in saving Jews during the war. We also hope to engage Rohatyn teachers and students in this continuing and important research project. The Rohatyn Yizkor Book chapter entitled “The Story of a Bunker” ends by appealing, “this Gentile should be well remembered”. With the Kidrons and the Snitmans at Rohatyn’s new Jewish cemetery. Photo © 2017 Jay Osborn. 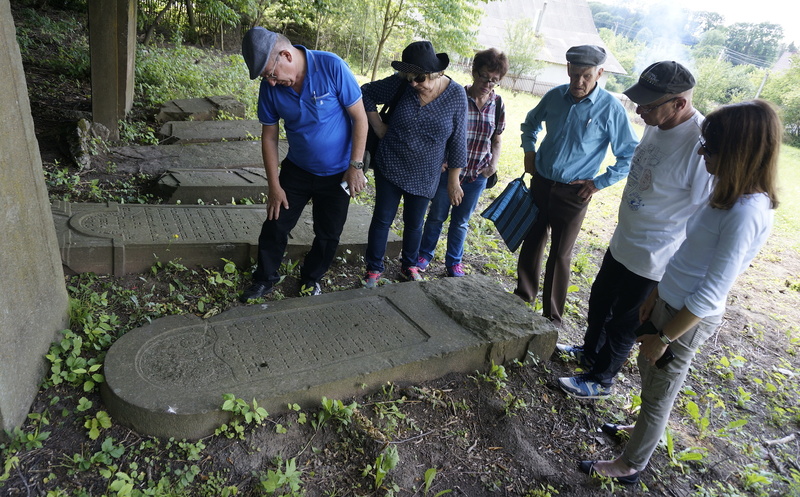 While in Rohatyn, we also toured several other Jewish heritage sites in the city, including both cemeteries and both mass grave memorials, as well as the area of the Jewish ghetto under Nazi occupation. Based on research David had done for Batya before their visit, we also walked around the probable sites of Batya’s ancestors’ homes during the 19th century. Those houses, like most in the downtown, were likely destroyed in the First World War, but their proximity to the river and the town square and the general perspective probably remains the same today. 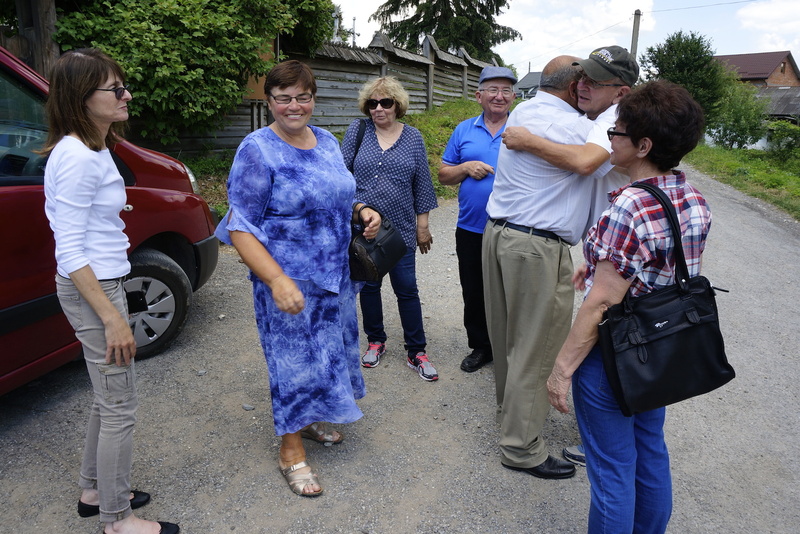 From Rohatyn, our group traveled to nearby Peremyshliany to visit the birth town of Batya’s father Moshe, before returning in the evening to Lviv. 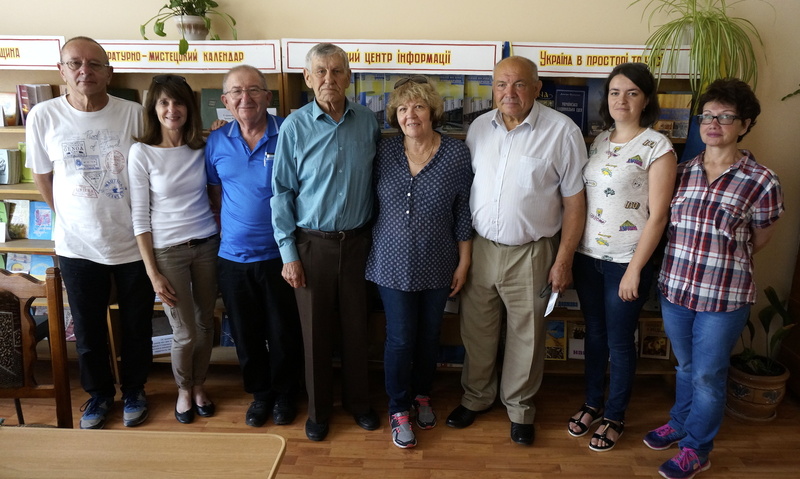 Jay and I would like to give a special thank you to Michael & Hana Snitman, both of whom were born in Ukraine (Chernivtsi) and who accompanied the Kidrons and us to Rohatyn. They acted as interpreters, and provided the day’s transportation, and were a delight to travel with as well. We are also grateful for the continuing support of the City of Rohatyn, the Opillya Museum, and of course Mr. Vorobets, without whom this emotional meeting would never have taken place.